What is Lurking in Your Attic? One of the places many of us ignore and avoid is the attic. The attic is typically the place where things have been thrown that we have been unable to make a decision about, so it is best to put it in the attic, otherwise known as purgatory, where things go to wait for their final destination. Clients don’t deal with the stuff in their attic because it is too hot, too cold, too hard to get to, too overwhelming, or will require too much time, so they just let it sit. Things sit in attics deteriorating. People are not even sure what is up in the attic, they just know it is a lot of stuff. If you are like most people, you know the attic is something you need to deal with, but you continue to put it off, but it still lingers in the back of your mind and weighs on you as you go through the days, weeks and months. We also have an attic in our mind. We have put stuff away, too painful to deal with, in the recesses of our mind. We don’t look at it, examine it, or acknowledge it because it is too overwhelming, will require time and will be hard. 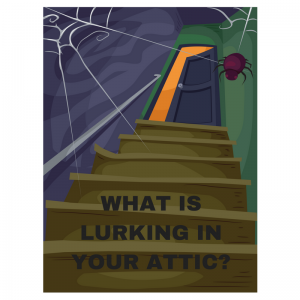 What is lurking in your attic-your physical and emotional attic? Here is how to begin to deal with what is there and slowly begin to wade through what has been pushed down and pushed away. Go searching. Go look into your physical attic and your mind attic and see what is lurking there. What do you see? What do you feel? What is there? Examine what is there. Is it valuable? Is it worth keeping? Is it helping you live your best life now? Is it useful? Make decisions. Make hard decisions. Decide to let it go or only keep it if you find it is adding to your life, not sucking the life out of you. Don’t delay any longer. Give it away. Trash it. Recycle it. Do what you have to do to clear the cobwebs and clutter. Get help if it is too overwhelming or too hard. Breathe. Feel the freedom. Embrace the new life you have created. Enjoy the whitespace you have created in your home and in your life. Attics can be dark, scary places, but only if we don’t have control over them. Once we take control, they can become places where beautiful, valuable things live and life can take on a whole new meaning. What is lurking in your attic? Go find out.